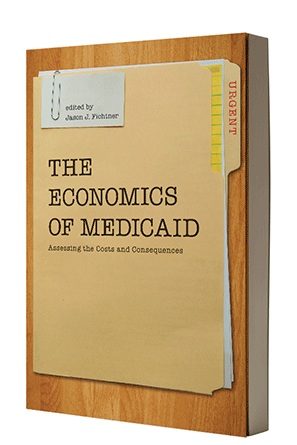 Twenty-four percent of state budgets went to Medicaid in 2012, making it the largest budget item in most states, explains Nina Owcharenko, Director of the Center for Health Policy Studies at the Heritage Foundation, in a book by the Mercatus Center, The Economics of Medicaid. – National per enrollee spending for Medicaid program was $5,527 in 2009. Connecticut had the highest per-enrollee spending ($9,577), while California had the lowest, at $3,527. – Sixty-five percent of national Medicaid spending in 2009 went towards the elderly and the disabled. The District of Columbia spent 77 percent of its funds on the elderly and disabled, while just 51 percent of Medicaid spending in North Dakota and New Jersey spent went towards that group. – In 2011, acute care services were responsible for 65.5 percent of national Medicaid spending, while long-term care services comprised 30.2 percent of spending. Medicaid spending has been on a dramatic upward trajectory. In 1990, state and federal spending on the program was $72.2 billion; in 2000, that figure had reached $206.2 billion. By 2010, Medicaid spending had reached a staggering $401.5 billion. In an effort to control rising costs, states have implemented a number of reforms. Forty-three of the 50 states instituted at least one cost-saving measure in 2013. One of the biggest ways for states to save money is to adjust payment rates for health care providers, and 34 states adopted some sort of provider rate restriction for 2014. However, while such reforms cut costs, changing reimbursement rates means that fewer health care providers are willing to participate in the Medicaid program at all.